How to Downgrade iPhone 6 from iOS 10 to iOS 9? Your iPhone may get stuck after you upgraded it to iOS 10, then do you want to downgrade it back to iOS9? How to downgrade iPhone 6 from iOS 10 to iOS 9 in a more simple way? Do you feel it’s a bit complicated to use iTunes in order to restore/ flash your iDevice? Now here is another good choice. Using 3uTools Easy Flash can make your flash experience more convenient and effective. iPhone iOS 10 beta1 has just been released, so you could probably meet with, it probably exist some problems in experiencing the new generation iOS system, for example, a lower system stability, a faster power consumption, lacking smoothness, being incompataible with some Apps and etc. Step 1. 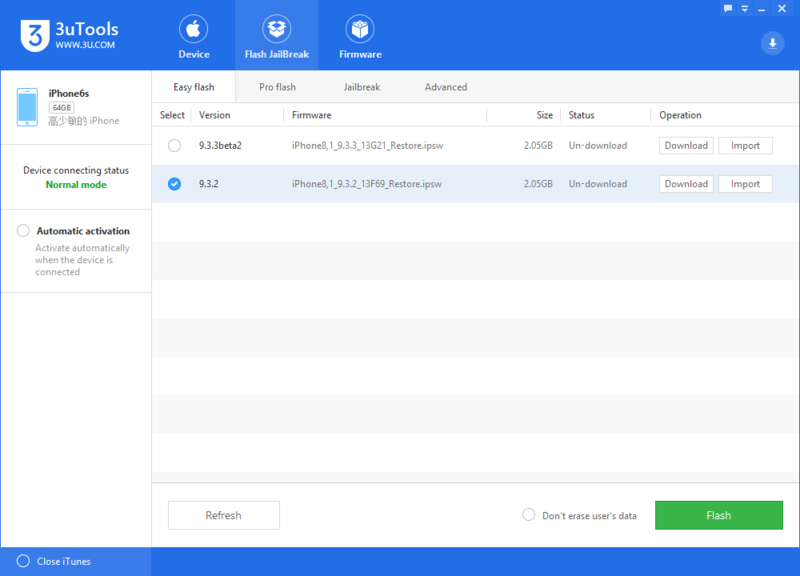 Download the latest version of 3uTools and connect your iPhone to PC using the USB cable. Step 2. After your iPhone is connected to 3uTools(PC version), please click “Flash Jailbreak”→“Easy Flash”.